Metal and glass accentuate Chicago high-rise’s iconic form. 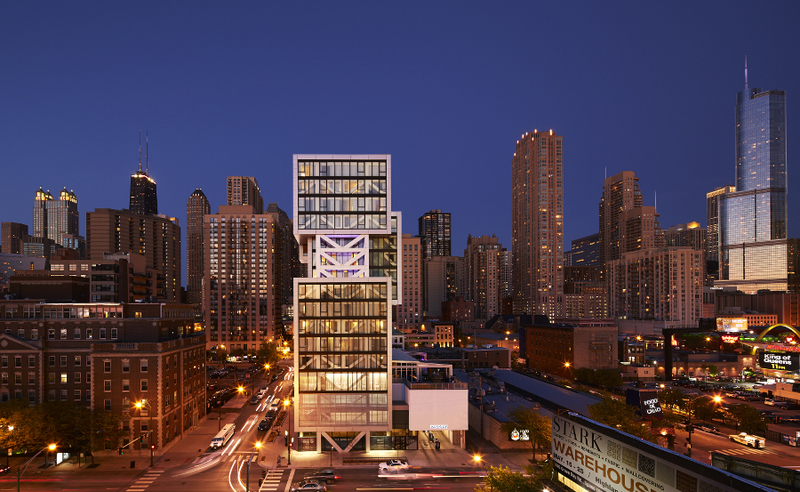 Given the odds stacked against it, Godfrey Hotel’s 2014 opening in Chicago counts as a major victory—even if it took more than a decade to get there. Valerio Dewalt Train Associates (VDTA) signed on to the project in 2003, after being approached by a developer affiliated with a mid-market hospitality chain. Four years later, following a delay in financing, construction was finally underway. Then the recession hit, the original developer went under, and the building remained half-finished. The case languished in bankruptcy court until 2012, when Oxford Capital Group purchased the property. Fortunately, boutique hotel operator Oxford Hotels and Resorts hired VDTA to complete the project—with few changes to the original plans. “It’s interesting that through the course of the almost four years that this sat wrapped in tarps, it remained desirable,” said VDTA’s David Jennerjahn. 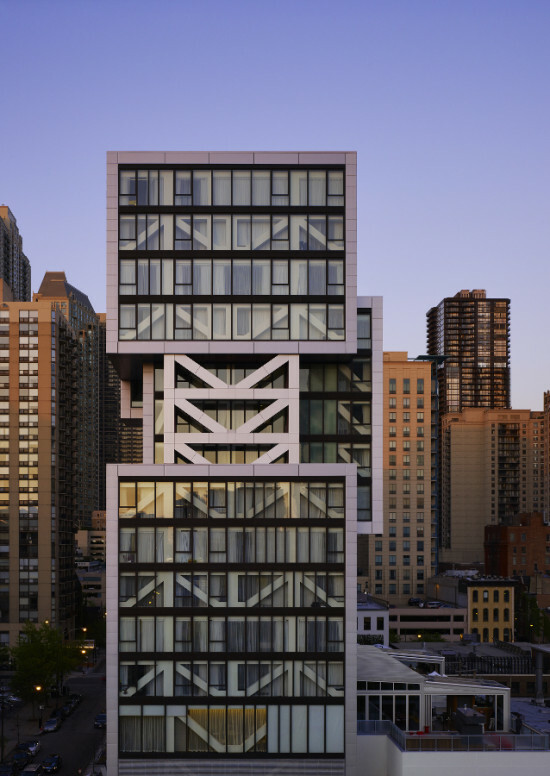 “For the hotel operator, it was a really distinguishing architectural design.” Together with its cantilevered form, Godfrey hotel’s slick metal panel and glass facade combines function and aesthetics in an iconic package. 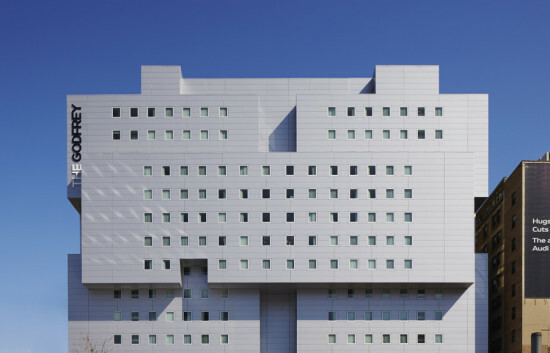 The hotel appears as a series of three offset rectangular boxes, stacked vertically. “The building has a very symbolic form—what I would call a very muscular form—and none of that is arbitrary,” said VDTA’s Joe Valerio. The offsets serve two purposes. First, they express the building’s structure, which follows the staggered truss system developed in the 1960s by William LeMessurier, a noted structural engineer. As the name suggests, LeMessurier’s method involves staggering story-high steel trusses on alternating column lines, thus creating large clear span interiors. Though the staggered truss system is usually deployed to create buildings that “look like a cereal box,” said Valerio, VDTA approached their structural engineer with an alternative proposal. “We nonchalantly said, ‘There’s a lot of redundant strength there. [The volumes] should be able to cantilever out,'” he recalled. 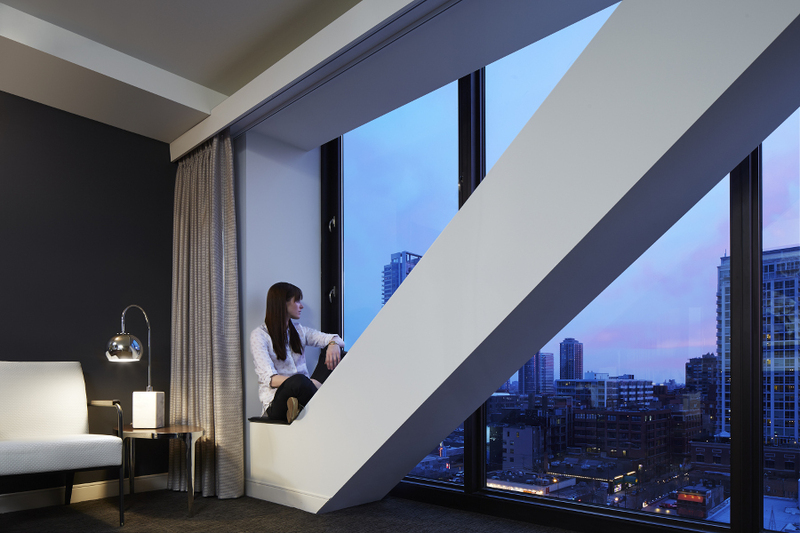 The structural engineer gave them the go-ahead, and Godfrey Hotel’s unique form was born. As an additional benefit, the stacked configuration allowed the architects to carve the interior spaces into a variety of room types and sizes, an idea they prized from the project’s beginning—and which Oxford Hotels and Resorts, in particular, embraced. The east and west facades are almost entirely transparent. “In 2003, no one had heard of LEED,” said Valerio. Noting the potential for solar gain, he explained, “If we were designing the building today, we wouldn’t have all-glass walls on the east and west elevations. We put them there because we wanted to take advantage of the views.” The glass also reveals the staggered truss system. Because the trusses run north-south, opening the building to the east and west was the only way to show them off. “That created other opportunities we did not even think of,” said Valerio. In some cases, he said, “the trusses really become a part of the room,” operating as built-in furniture.